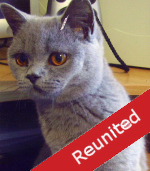 Register the details of your lost pet and we will automatically e-mail you with details of pets which are added to our database, which match your missing pet, for your full subscription period. Please visit our How We Work page for more information. Register your lost pet and we will automatically e-mail you with details of matching pets which are added to our database. Please visit our How We Work page for more information. Please enter the Pets Located reference number and click 'go'. The reference number will be in the format 'A00000000' or 'AB00000000' (not case sensitive). This will take you straight to the details of the relevant lost or found pet.